james mckay dot net » Is it time to kill off wikitext? Is it time to kill off wikitext? Anyone who has ever tried to edit Wikipedia will have encountered wikitext, the rather esoteric syntax used for markup on its pages. Wikitext is, in theory at least, simpler than HTML. Two single quotes delimit ''italics'', while three single quotes indicate '''bold text'''. [Square brackets] indicate external links, [[double square brackets]] indicate internal links, and so on. A lot of other wiki software uses similar syntax. For example, Trac, a popular open source bug tracking system, uses a very similar markup language, and since you can also embed HTML in it, and even use a fairly sophisticated macro language, it allows very fine-grained control of the contents of the page. For the novice, there is a helpful toolbar at the top of the edit box, so that you can easily mark up various parts of the text as bold, italics, hyperlinks, and so on. However, in late 2007, it somehow feels wrong. As wrong as it felt not being able to get broadband in late 2005. There are many rich Internet applications these days that raise the bar significantly in terms of quality of user experience. Slick, good looking, easy to use sites are becoming more and more commonplace, and while ones such as Google Maps or EyeOS still have a bit of a “wow” factor, it’s getting easier all the time to develop them. With libraries like jQuery, for instance, you can implement a Google Suggest-style Ajax search facility in a couple of hours. With it becoming increasingly easy to create elegant rich Internet applications, and the tools to do so being readily available, free and open source, having such an awkward and clunky way of editing content is beginning to look very last millennium. It’s time it went the way of the dinosaurs. Posted at 12:30 on 26 November 2007. The current makeup, including the template system, is a killer feature of MediaWiki. It’s simple, streamlined, yet infinitely extensible. You’re just not going to achieve this level of flexibility with a WYSIWYG editor. 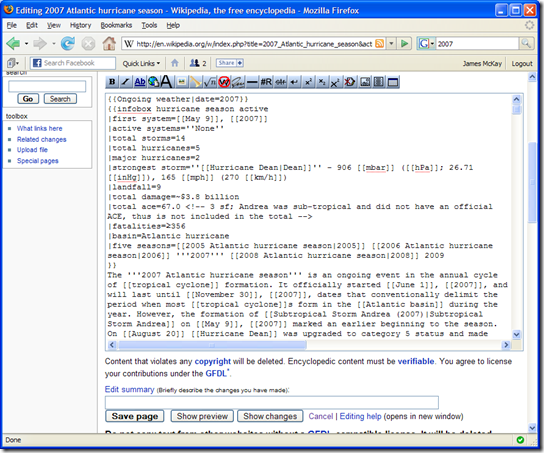 Besides, WYSIWYG is not suitable for Wikipedia’s mission, which has content over presentation. It has its uses – for example, for publishing systems. But not for a knowledge base, nor for any kind of documentation, which needs semantic markup. So would you say that the benefits of wikitext and WYSIWYG editing are mutually exclusive, or do you think that rich text editors in the browser are not mature enough as a technology to handle that kind of thing yet?